Noticing New York: Selling a $100 Million Plus Library For What? A Pittance! More Transparency Please. Selling a $100 Million Plus Library For What? A Pittance! More Transparency Please. That’s the mayor in 2013 as a candidate for election speaking about the tragedy of selling off and shrinking our public libraries, transforming them into real estate deals that benefit developers, not the public. 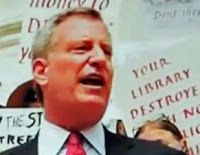 One of the libraries about which Mr. de Blasio was speaking was the Brooklyn Heights library, Brooklyn’s central destination library on Cadman Plaza West at the corner of Tillary and Clinton. 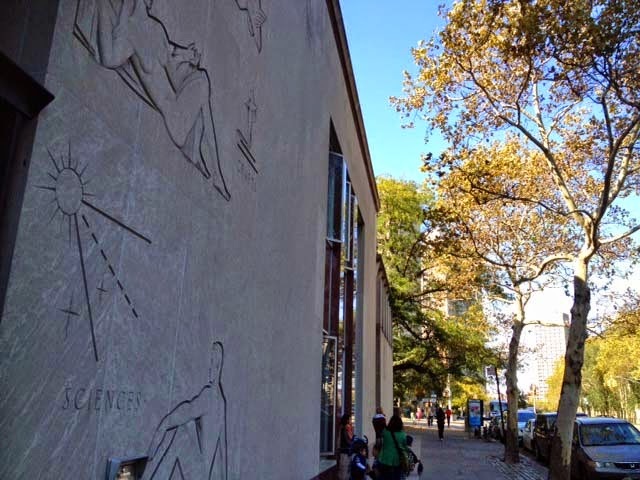 The Brooklyn Public Library is pushing a proposal to turn it into a luxury condominium tower. The proposal involves a vastly shrunken so-called “replacement” library of minimal size. The current library is 63,000 square feet; the proposed “replacement” just one-third, 21,000 square feet. The current library has about 38,000 square feet above ground, the proposed “replacement” just 15,000 square feet above ground. Probably because the sale does not make sense from the public’s point of view and is proceeding as a boondoggle hand-off to a developer, the Brooklyn Public Library and EDC, the city real estate development corporation that serves developers, is proceeding with an extreme lack of transparency. This extreme lack of transparency extends even to BPL’s refusal to provide basic information about how much the public is losing and how little the BPL is selling this asset for, including all the costs that should be netted out of the sale. There many things to consider about what is being lost if this essential amenity is transferred out to a developer looking to make millions, even including the park space and trees surrounding the building and the sale of the public’s light and air. (Urban renewal was once used to bring this site to a lower density in order to have that light and air.) 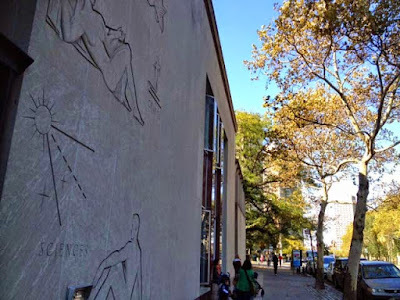 We have given some consideration to this before: Tuesday, October 7, 2014, The Public Loss of Selling And Shrinking the Brooklyn Heights Library- How Great Will the Loss Be? Let's Calculate. And the BPL has already been asked to identify the costs of selling the library which they have refused to do: Thursday, October 9, 2014, Open Letter To Brooklyn Public Library President Linda Johnson and Friday, February 6, 2015, Open Letter To Brooklyn Public Library Trustee Peter Aschkenasy Re Commitment to Provide Information About Library Sale. Now, the weekend before the hearing, it is probably time to fill in the gap and supply, in basic bookkeeping terms, some fundamental calculations of the dollar value of the asset the BPL is selling and, in dollar terms, how that sale of this asset at a pittance, netting perhaps less than nothing, will be a loss to the public. We also have a some new information to work with despite the BPL’s efforts to be totally opaque. The Brooklyn Heights central destination library is 63,000 feet of extraordinarily serviceable (and adaptable) square feet. That includes two half-floors of underground space that, similar to the 42nd Street Central Reference Library, were set up to hold books for easy on-the-spot retrieval. To say that the building is sturdy is an understatement: When it was built, it was built with space set aside for a bomb shelter with the thought that people could go there to be protected against a nuclear attack. The building was built in 1962 (at a cost in today's dollars of about $20 million) and opened with a collection of 90,000 volumes. In 1991 it was enlarged and upgraded (at a cost in today's dollars of about $10 million). Then, additionally, a reclamation of the space people once thought might be used as a bomb shelter added even more space for books. It is therefore relatively safe to say that based on these original costs the book value of the library building alone is in the approximate neighborhood of $30 million. That’s one starting figure. . .
What if a new library were reconstructed in the bottom of a luxury tower? The BPL tells us that reconstructing a new, much smaller library of only one-third size (21,000 square feet) to replace the library will cost $10 million. But previously they said it would cost $12 million. Making these low-ball costs all the more suspect and fanciful, the BPL is proposing to sell the library, locking in this extreme shrinkage to an exact footage, without even bothering to design a new library first (let alone engage the public in determining its library size needs). Actually, putting this vastly shrunken 21,000 square foot library in the bottom of the luxury tower for which there are still no public designs either will probably cost more than $16 million. Yes, $16+ million. That’s based on the costs of “replacing” (and shrinking) the slightly larger Donnell Library. That construction has announced overruns although it still isn’t complete and may not be complete until 2016. It has long been known that the NYPL’s sale of Donnell effectively amounted to a loss of millions of dollars of public library assets. The sale of this library is closely replicates the sale of Donnell with an overlap of people involved in the planning. Selling public assets for the benefit of developers is more expensive than everyone might immediately suppose. Unless the BPL plays these shell games (and that involves having to shrink the library as part of the game) it quickly becomes apparent how much the public is losing. The BPL refuses to give figures, but if the BPL were putting a full scale replacement library in the bottom of the luxury tower it would be costing the BPL around $48 million just for the rebuilding costs . . . And the developer would also then probably be paying far less than $30 million gross price. Result? :A very substantial loss. There is a much better way to evaluate the public dollar value of the building that we are losing in this sale. That’s to consider the cost of erecting a free-standing building on the site today. One reason that’s important? : Because, whatever size library is put in the bottom of a luxury condominium, that library can never be enlarged afterward. The current library is enlargeable: Owned by the city, the city can build on the site to enlarge the library or construct for other public uses as the city grows as it and the neighborhood is doing very fast now. If the BPL erects a free-standing 21,000 square foot replacement library at the site of library, it would cost $20 million according to library spokesperson David Woloch (at the 6/10/2015 Sunset Park Library redevelopment meeting). Constructing a full-scale, free-standing 63,000 square foot replacement library would cost $60 million. One might argue, as the BPL promoting the sale no doubt would, that such a library would be newer and "state-of-the art" and that the dollar value involved would not yet be subject to any depreciation to reflect any aging of the building. 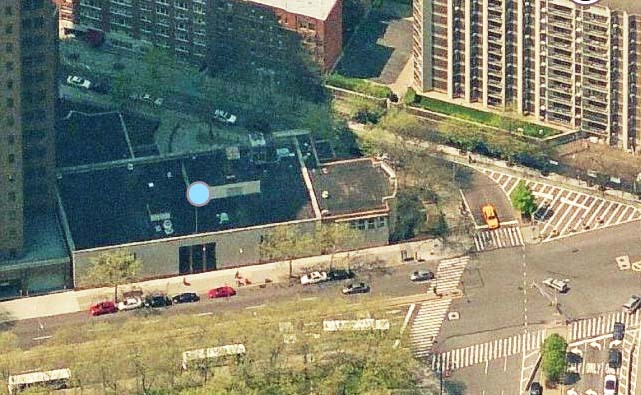 On the other hand, one of the things that is thwarting the te BPL in its arguments for selling its building to a developer is that the Brooklyn Heights library was built to last. It's a case of: They don’t build them like they used to. As much as the BPL would like to neglect the building and drive it into the ground, fail to clean rest rooms, or make the aspects of the building superficially unappealing, the building frustrates them with its solidity. Crazy enough, it was meant to be still standing if there ever was a nuclear war. The BPL has fallen all over itself in silly efforts to exaggerate the building’s current needs. Principal among these efforts has been the BPL’s refusal to repair the air conditioning and its exaggerations that fixing the air conditioning could cost almost $5 million or that making the building pristine and new again could cost around $10 million. But the BPL has refused to release the information that is available about previous assessments that contradict what they are saying about the air conditioning repair needs. The BPL initiated plans to turn this (and other libraries) into a real estate deal with a decision that goes back to at least 2007. Its plan wasn’t announced until January 2013, a year before Bloomberg left office. The air conditioning conveniently went out of commission six months before the planned announcement of sale where air conditioning problems would be cited as a reason for the sale. $30 million? $48 million? $60 million? Those are figures for the dollar value of the library building alone. But you can’t get a library just for the cost of building the building. You have to also buy the land and own the development rights. What is the value of the land under the library that we must include as part of the dollar value of the public’s ownership of the library? The developer is paying a gross price to the BPL of $52 million so the value of the land and development rights that must be added to value of the building is surely at least that. But the developer isn’t paying to buy all the land or all the development rights so the actual figure is higher than that. How much then to the $52 million should we add for this? In addition, what the developer is paying includes a discount for other costs like the cost of demolition. The public won’t incur any cost of demolition if it retains the library so that adds to the public value of land the public retains. How much then to the $52 million should we add for this? The developer is also incurring perhaps $10 million in costs to build the shell for the shrunken replacement library, in effect an additional part of the purchase price paid to the library. How much then to the $52 million should we add for this? $10 million? The developer must also rent space for a tiny temporary library (7,500 square feet) for the four years or so the BPL expects it may take to build a shrunken replacement. How much then to the $52 million should we add for this? In the case of Donnell, rent for the tiny cramped interim library beginning when Donnell closed in spring 2008 was pursuant to rental lease terms calling for “payment of $850,000 for the first year (with possible increases thereafter).” - How much then to the $52 million should we add for this? In the case of Donnell, outfitting that tiny cramped temporary library cost the NYPL, “nearly $5 million.” One thing that is not yet clear at the moment is whether this outfitting expense would be a cost borne by the BPL (i.e. public), thus an additional public cost of the transaction, or by the developer, in which case it would be an extra factor raising the value of the land and development rights. The developer is also incurring other costs in buying this land. Contributions to politicians and elected officials including Mayor di Blasio should properly be considered an additional cost to buy the land and development rights. When the developer pays his architect more so that his architect can send money in the mayor’s direction, that too should properly be considered an additional cost to buy the land and development rights. How much then to the $52 million should we add for this? In fact, it should not be considered that the developer is buying this as unencumbered land in the normal sense. Because it is a library that the public values and because this deal will properly arouse anger and suspicion with the public it comes with many hurdles, many toll booths that have to be passed through paying fees to high-priced lobbyists and lawyers to sell a narrative skewed to and paving the road for the public and their elected officials to ignore the obvious math problems associated with this shortchanging of the public. Among other things the sale will have to go through a multi-year process where the question must be evaluated whether it is absurd to sell this public assets netting virtually nothing. How much then to the $52 million should we add for this? How much then is the value of the land and the development rights to the public? The value of the land that will appreciate in the future? The development rights that can be used for future expansion and public good? Somewhere between $65 million and $100 million? More? The design for the Brooklyn Heights luxury tower has yet to be released and various statements about its final true height have been misleading but one figure given in the New York Times says it will be a 38-story tower. The developer has spoken of having extra tall ceilings to make it seem taller and give the apartments more luxurious views. The BPL states that it is getting a gross price of $52 million for selling and shrinking the library. Out of this must be netted certain costs, most immediately the $16+ million to build the as-yet-undesigned “replacement” library, bring the net cash figure for selling the library down to less than $36 million. From than $36 million much more must be subtracted. The reduction in space will supposedly be associated with shifting the functions of the library, business and career functions that ought better to remain in growing Downtown Brooklyn, to cram them into the Grand Army Plaza library. Will some/all of these functions actually just disappear? No additional space will be built at the changed location so sacrifices will have to result. It is not that many years ago a space expansion was required at the Grand Army Plaza library. The BPL has acknowledged that cramming the functions in will entail substantial construction costs but refuses to furnish these cost to the public. At one time the BPL president Johnson said they were irrelevant and should be ignored and another time BPL spokesperson Davis Woloch said the BPL simply doesn’t know what those costs will be. Shrinking a library before designing it? Selling a library before knowing the costs of doing so? Is this lack of transparency or total stupidity? Some of the reductions at the Brooklyn Heights Tillary Clinton Library will also have to be taken up by other BPL facilities. Are those costs and sacrifices similarly unknown and unevaluated? There is the cost both to the public and to the BPL of keeping books off-site and moving them around and these costs can be far heftier than the BPL acknowledges. There is the cost of moving to a temporary library. The cost of moving back. The possible cost of outfitting the temporary library ($5 million like Donnell?). These figures which the BPL will not furnish or account for could easily wipe out the paltry $36 million remaining. It could readily adjust the miniscule “net cash” situation taking it into deep negative territory. That’s a problem for the BPL, which is trying a divide-and-conquer, smoke-and-mirrors strategy, trying to convince other communities that they will be benefitted by the squandering of these library assets. The BPL is trying to convince these other communities that if a library is handed out as a prize to a developer this first time with the central destination library in Downtown Brooklyn that their own neighborhood libraries won’t similarly come up somewhere, next in a public-be-damned transaction as the BPL moves down the list in its plan that we know looks at “leveraging” all its real estate assets. But to be fair, the BPL is not selling off the entirety of its assets at this site when it sells the library for this shrinkage plan. With a new library one-third the size of what exists now it may be thought of as selling off somewhere in excess of two-thirds of its assets, not the entire asset. In excess of two-thirds because, with the development rights transferred, this library can never be enlarged again if the community grows or if the shrinkage turns out to be the mistake that most people have judged it to be. 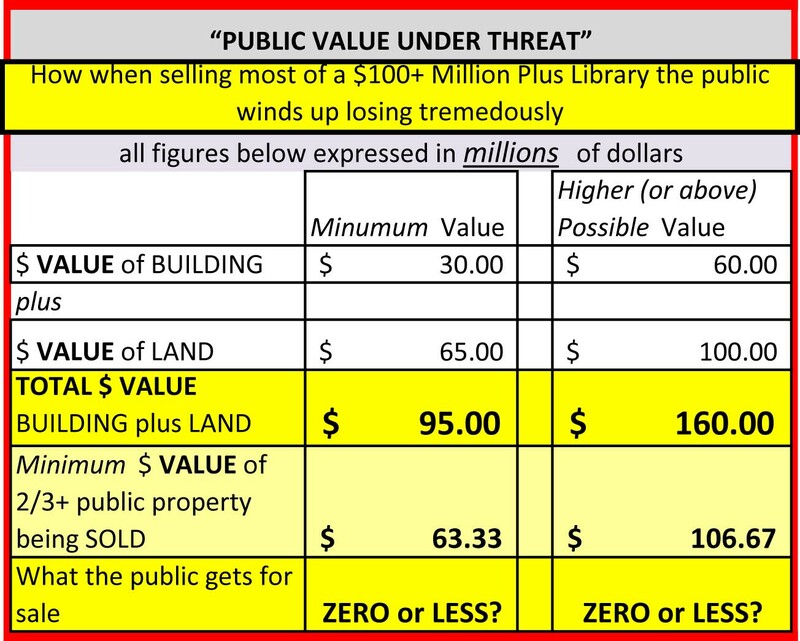 Math-wise, in dollar value terms, selling off more that two-thirds of the library amounts, based on the previous figures, to selling off $63+ million to $106.7+ million in assets (2/3 x $95 million to $160+ million, plus an adjustment up for selling the development rights). For this sale the library will get perhaps zero or less. The smaller, shrunken library, forever to be a depressing reminder of this era of rampaging privatization and plunder would, albeit, have a value. At the high end, the building’s value would be maybe the $20 million the BPL would spend if it were building a free-standing enlargeable building. Since that’s not what the BPL is getting maybe we should subtract from that. Added to that $20 (or less) million building value we must add some associated dollar value for part of the land. Using the earlier figures that would come to less than $21.7 million to $33.3 million (1/3 x $65 million and $100 million, from which must be subtracted a substantial figure for the extraction of all the development rights). 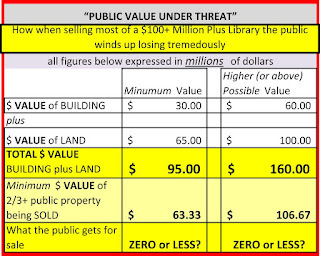 In other words we would go from having a library with a dollar value to the public of between $95 million to $160+ million, to having a much smaller library with a dollar value to the public of substantially less than, at best, $41.7 million* to $53.3 million. . .
. . . The bottom line is that we would have sold off $63+ million to $160+ million in assets either at a public loss or netting virtually nothing.. . . Bottom line, in a time of increasing wealth, income and power disparities, this proposal will amount to a huge transfer of capital assets from the public realm to the private. I believe I have not been unfair in supplying any of these numbers. I think the unfairness is that the BPL has refused to provide such numbers. Book ends? : Brooklyn's two central destination libraries, the Downtown Brooklyn Heights Library and the Grand Army Plaza Library, were both designed by the same famed architect, Francis Keally. Meanwhile, in other privatizing plans very reminiscent of these attacks on libraries, the Mayor is looking to sell our public housing assets. That includes proposing to shed 14,000 units of public housing from the inventory. Well after we loose all those units we could pick up few again by selling all the libraries? Who benefits from these shell games in the end? Surely not the public.